Few things are nicer than a lovely-smelling candle burning on a spring afternoon. Unfortunately, few things are also a bigger firestarter for a residential fire! Few things are nicer than a lovely-smelling candle burning on a spring afternoon. Unfortunately, few things are also a bigger firestarter for a residential fire! Lighting a candle is something that most people enjoy whether it’s bathtime or dinner time, so doing so safely is paramount. 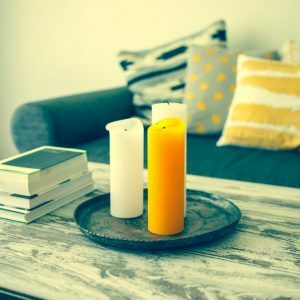 How can you burn a candle safely in your home? Regardless of where you want to burn your candle, make sure that the flame remains within your sight at all times. Whenever you leave a room, even if it is just for a few minutes, extinguish the candle and re-light it when you return. If you have a habit of lighting candles before bed and waking up to a burning wick in the morning, consider adding flameless candles to your bedside for the flickering glow without the fire hazard. Another common mistake homeowners make when they burn a candle is leaving them near flammable objects. Always keep lit candles far away from things like furniture, curtains, bedding, carpets, books, stacks of paper, decorations on the wall that are flammable, and anything else that could catch fire. Also, make a point to keep the flame out of reach from any children or babies within your house–and that includes “knocking” reach on a lower bookshelf. Take the time to trim your candle’s wick to ¼ inch or less every time you burn a candle. Long wicks or tilted wicks can lead to burning, wax dripping, and extremely high and dangerous flames. Additionally, make sure that you place your candle in the appropriate candle holder for your type of candle. Candle holders should always be fire resistant, durable, and big enough to stop wax from leaking out as your candle burns. This entry was posted on Monday, April 17th, 2017 at 12:44 pm. Both comments and pings are currently closed.